I am always skeptical of Chinese restaurants that have Panda or Wok in their name. But Williamsburg, MA’s Panda Garden had been strongly recommended to me and the online menu listed some interesting sounding dishes, like Twice Cooked Pork and Pork with Spicy Tea Sauce, and there is a large vegan menu with fake meats. The menu describes their vegetarian meats as being made of Chinese mushrooms, soy bean, vegetables and seaweed and states “There is NO Chicken or Beef!”. We tried the vegan Mu Shu Pork and the Kung Po Chicken, both of which had very convincing fake meats and light flavorful sauces. The Dumplings: It is odd that a restaurant with an extensive vegan menu doesn’t serve a vegan dumpling, their veggie dumplings contain egg. 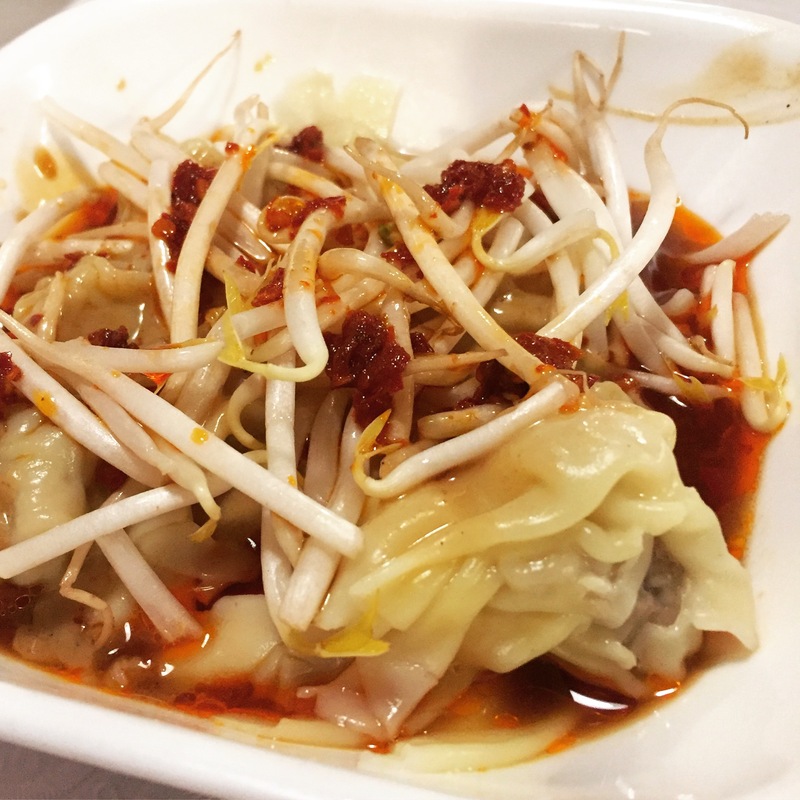 Wonton with Hot Sesame Sauce – These wontons came adorned with bean sprouts and dabs of red chili paste. 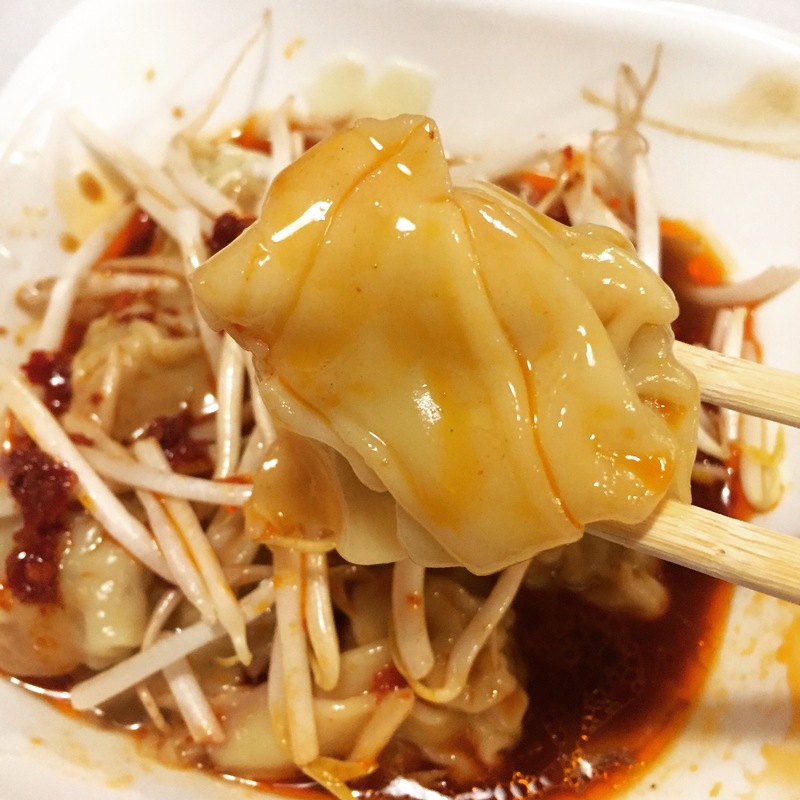 The wontons were filled with pork and scallions and the sauce was a mix of sesame paste and chili oil. The sauce was good, with a nutty sesame flavor but wasn’t particularly spicy and could have been served a little hotter temperature-wise. Overall this was a pretty decent version of this dish, but not particularly hot nor spicy. Pan-Fried Meat Dumplings – Panda Garden makes its own pork dumplings which are served steamed or fried. 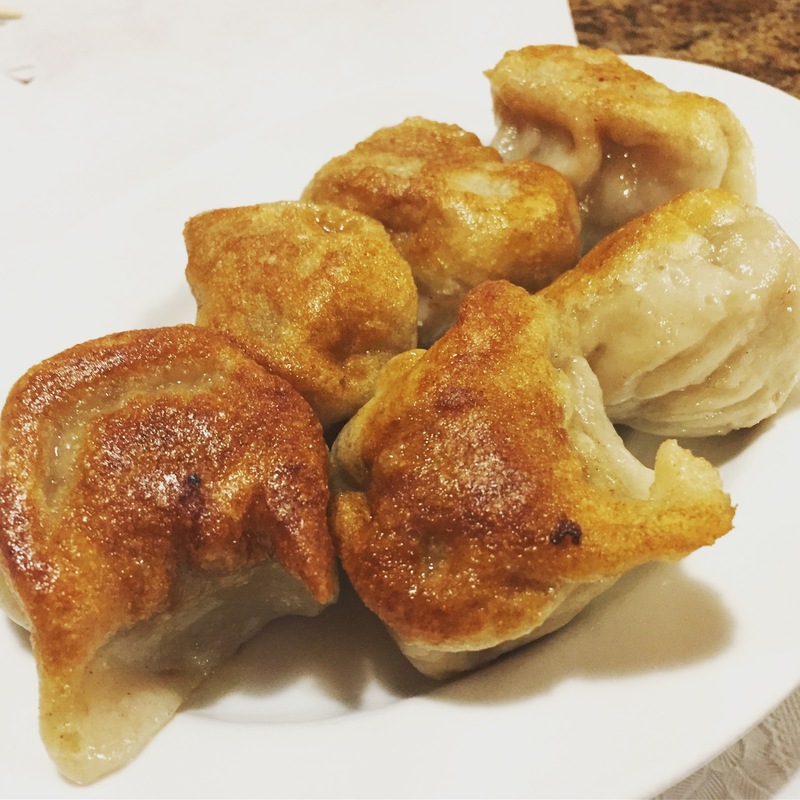 When ordered fried, these large dumplings are cooked pot-sticker style, pan fired one side and then covered to steam through. The wrappers were moderately thick, but not heavy and stodgy, and fried up to create a nice crunchy base for the dumplings. The pork filling was a visually off-putting brown color, that made me think initially that the dumplings were actually stuffed with beef, but they had a deep, robust pork flavor. I don’t know if it was the cut of meat, the breed of pig or the seasoning that gave the filling its dark color. This was a good plate of fried dumplings. The Dipping Sauce: The dipping sauce for the pan fried dumplings was unimaginative, your basic mix of soy and sesame oil. The Location: Williamsburg is one of the “Hill Towns” on the edge of the Berkshire mountains, about 15 minutes minutes West of Northampton, MA. Route 9 is the main drag through Williamsburg and Panda Garden is located on Roue 9 at the Colonial Shoppes Plaza. This entry was posted in Chinese, Pan Fried, Pork, Vegan, Vegetarian, Wontons. Bookmark the permalink.